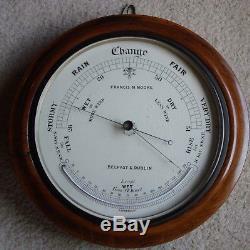 An exceptional, highly collectible 1800s Francis M Moore barometer-thermometer. Moores were a generational family of scientific instrument makers in Belfast and later Dublin in the 1700s and 1800s specializing in instruments for ships. Francis M was appointed Maker to the Lords of the Admiralty. An exceptional decorative antique as it is, it would require attention to be a working barometer. As a thermometer it reads 2 degrees high. Believed to be walnut with beveled glass. 15.5" across -- 4" deep -- 15 lbs. My neighbor's great grandfather was a sea captain who brought this when he emigrated from the British Isles. I've had it since 2007. Two family ownership, his and mine. All my photos and scans are the actual item for sale. I don't use packing peanuts - recyclers hate them, and they never decompose. Importers are responsible for meeting their country's import restrictions. You won't lose a dime provided I must get it back in the condition I sent it. About useraccount2 (I'm also useraccount1). Changed to useraccount2 on Feb. Mostly-retired political consultant, consent technician, real estate broker, journalist, educator. Two guidelines we use: We don't say it's antique unless we believe it is over 99 years old. The only exceptions are motor vehicles, boats, radios, and phonographs which are ruled by a different convention. In a collectibles industry filled with frauds and fools we are never the first and seldom the second. Lost in transit = 0 (Because we pound them and pound them to FIND IT). Google Who is Rey Barry of Charlottesville VA. Quodcumque Latine scriptum, altum videtur Translation - "Anything in Latin looks impressive". The item "Antique 1800s Wall Barometer & Thermometer by Francis M. Moore of Belfast/Dublin" is in sale since Friday, November 24, 2017. This item is in the category "Collectibles\Science & Medicine (1930-Now)\Scientific Instruments\Barometers". The seller is "useraccount2" and is located in Charlottesville, Virginia. This item can be shipped worldwide.